There are two options when it comes to onboarding schools to the Assembly Platform, and allowing them to authorise your app. 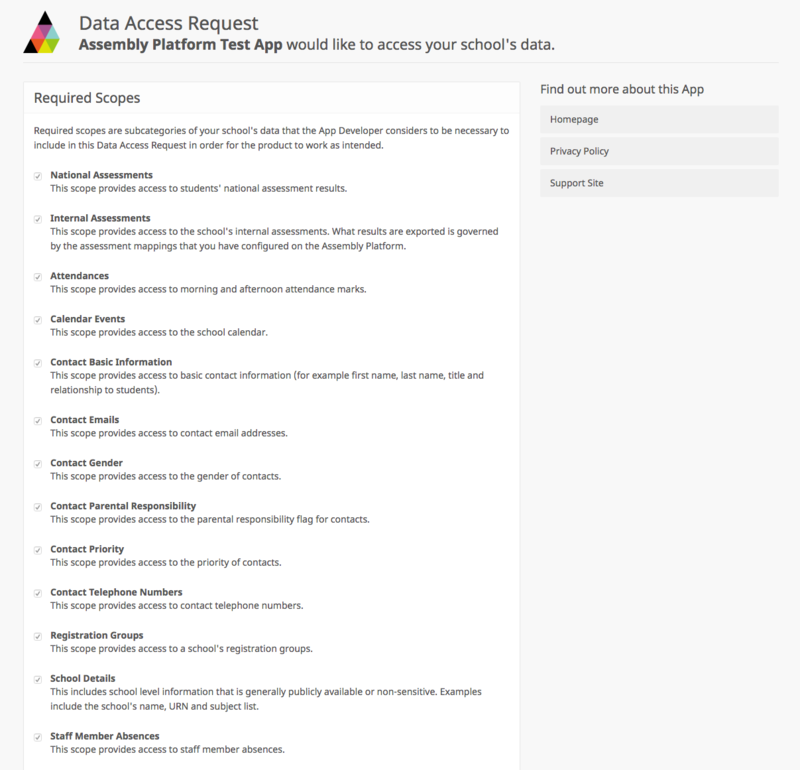 You can choose to first direct schools to sign up and connect to the Assembly Platform, where they can later also authorise your app. 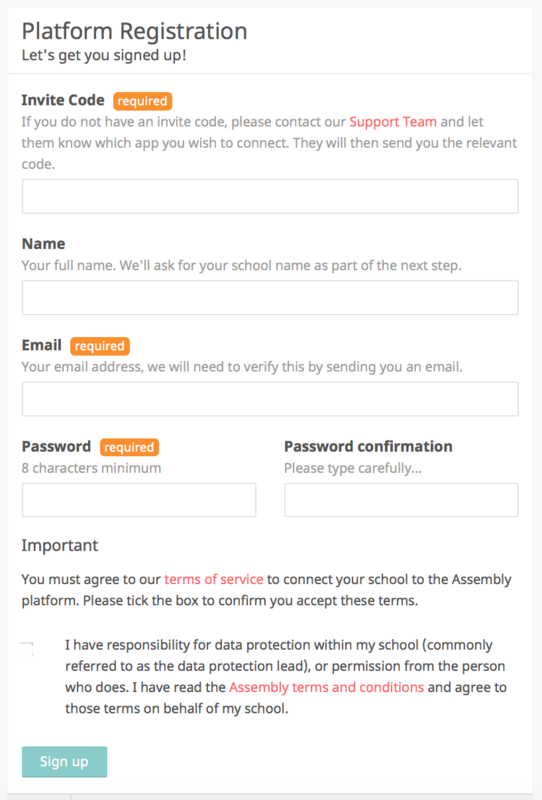 Step 1: Ask the network manager or data manager of the school to sign up to the Assembly Platform. They can contact help@assembly.education to obtain the invite code. Step 2: The school downloads, installs and configures our Connector. Full instructions can be found on our support site. Step 3: The school navigates to Apps section of Platform, locates your app and clicks Authorise App. At this point the Platform will start to pull the relevant data scopes, which will be made available to your app. Please note: for your App to appear on our Platform, you must ensure the "List this App for other schools to find?" tick box is selected on your app settings. Alternatively, you can provide a link within your app or on your website which allows schools to authorise the relevant data scopes. 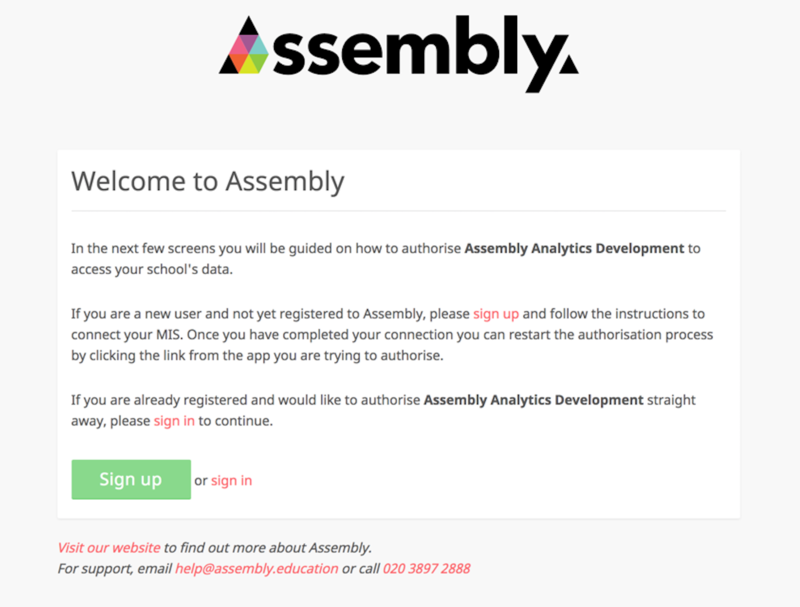 Step 1: The school clicks a link from your app authorising the Assembly Platform to access their data. Step 2: They are redirected to our landing page. 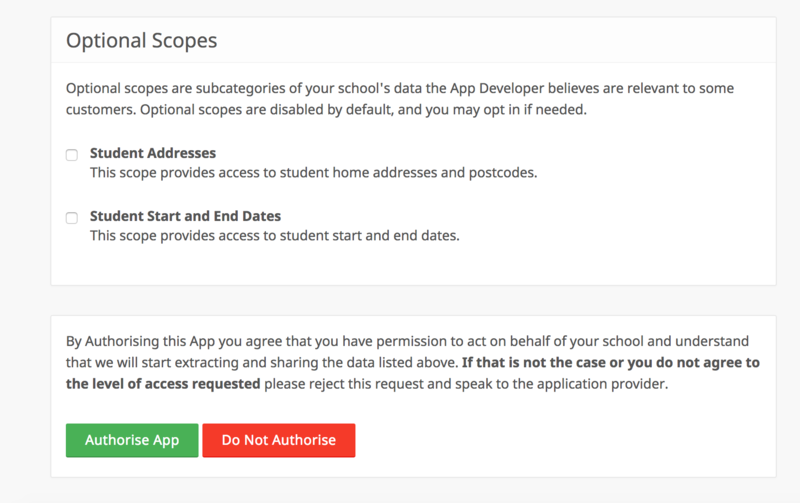 Step 3: Schools that are already signed up to the Platform can sign in, and click Authorise App to allow the Platform to access the relevant data scopes. They will then be redirected to your redirect_url. Schools that are NOT already signed up to the Platform click Sign up to start the process. Step 4: The school downloads, installs and configures our Connector. Full instructions can be found on our support site. Step 5: Once setup is complete, the school is then able to authorise your app - either from the Apps section of the Platform, or by clicking the link on your site again.